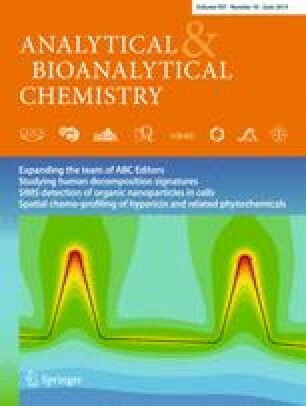 In this study, we demonstrate the application of ambient mass spectrometry for measuring fatty acids from various biological sample matrices such as olive oil, fish oil, salmon, and human serum. Optimum performance was obtained after spotting samples onto thin-layer chromatography (TLC) plates as sample substrates for a custom-built solvent-assisted desorption/ionization mass spectrometry (DI-MS) interface. Good to excellent linearities (coefficients of determination, 0.9856 to 0.9977) and reproducibilities (average 6 % relative standard deviation (RSD) using syringe deposition) were obtained after application of an internal standard. Signal suppression phenomena were minimized by separating the analytes by TLC to some extent prior to DI-MS, leading to a fourfold increase of signal-to-noise ratios as compared to single spot mixture analysis without TLC separation. Published in the topical collection Mass Spectrometry Imaging with guest editors Andreas Römpp and Uwe Karst. The online version of this article (doi: 10.1007/s00216-015-8630-5) contains supplementary material, which is available to authorized users. GC acknowledges a fellowship from Rotary International (District 2120, Molfetta, Bari, Italy) for his research visit to Saarbrücken. The authors acknowledge Chemia s.r.l. (Bironto, Bari, Italy) for the GC analyses. DAV is grateful for general research support by the Alfried Krupp von Bohlen und Halbach-Stiftung.